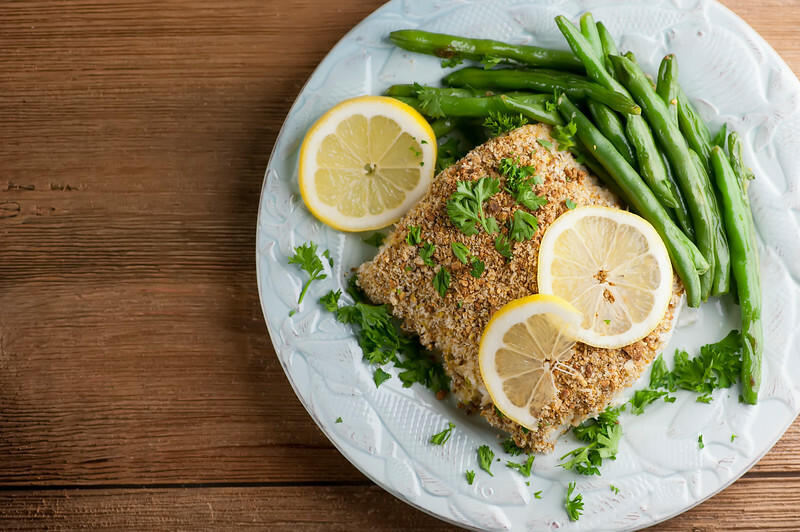 This easy recipe for pistachio roasted cod adds a delicious crunchy coating to the delicate flavor of the seafood for a healthy and flavorful supper! Every weekend when I am figuring out the menu for the week (yes, I am that person who figures out dinner a week in advance), I ask the Southern husband if there is anything particular that he would like that week, he invariably says, “oh, something with seafood.” And since seafood is one of those good and good for you suppers, I am working hard at building up my repertoire of seafood offerings. 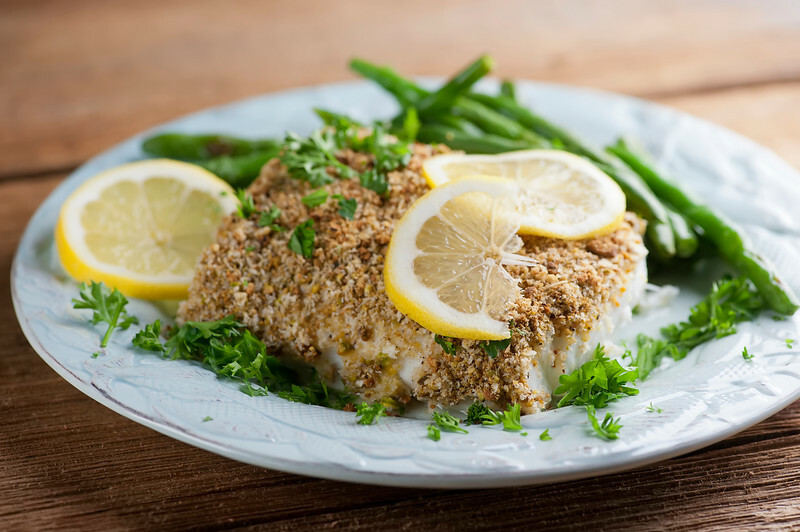 One that we both love is this easy pistachio roasted cod – tender flaky cod filets with a crunchy crust and a little zing of lemon. Ready to add some seafood to your supper? Let’s make it! I like cod because it’s easy to find and it is a mild, tender fish, but feel free to swap in the fish of your choice – just make sure it is boneless and about the same density. Same goes for the nuts – if you are more of a pecan or walnut person than a pistachio person, use those instead. Don’t you love flexible recipes? One way or the other you are going to mix up some finely chopped nuts with some breadcrumbs and some Old Bay spice, and press it all over your fish. Pop it in a hot oven and 15 minutes later you are sitting down to a delicious, nutritious supper. Breaking news: when I asked the Southern husband what he wanted for supper this week, he asked for my pastina with egg and cheese. The guy knows how to keep me on my toes! Preheat oven to 425 and line a rimmed baking sheet with not-stick foil or a silicone mat. Put nuts in food processor and pulse until they are finely chopped. Mix the nuts with the bread crumbs and the the Old Bay seasoning. Place the cod filets on the baking sheet and brush the sides and the top with the beaten egg. Press the nut mixture onto the cod. Roast for 15 minutes and then remove to plates. Garnish with parsley and lemon wedges and serve. You can either use panko bread crumbs (for a crunchier texture) or fresh bread crumbs (for a softer texture). Whirling one slice of bread in the food processor should give you the right amount of crumbs. This looks terrific! I’m going to try it this weekend. I’m always looking for fish recipes that don’t taste too much like, well, fish! Thank you! Ha! I know what you mean about the fish thing – the Southern daughter feels the same. Hope you love it, my friend! You don’t say if nuts should be salted or not? I will use unsalted as other ingreds seem to have sufficient salt?? This is such an easy way to prepare cod….and so tasty. I baked it in a toaster oven which worked well with this change. A little lower heat and less time. I recommend try this! Thanks Kate! I’m so glad you liked it! I learned my recipe writing and cooking skills from the best of the best. xoxo!